Pangolins are strange little creatures, with their diet of ants and termites, and the entire outer surface of their bodies covered with armour-like scales (face, belly and the inner surfaces of the limbs are either hairy or naked). When in danger, pangolins are able to roll up in a ball, presenting only that armoured surface to a predator. 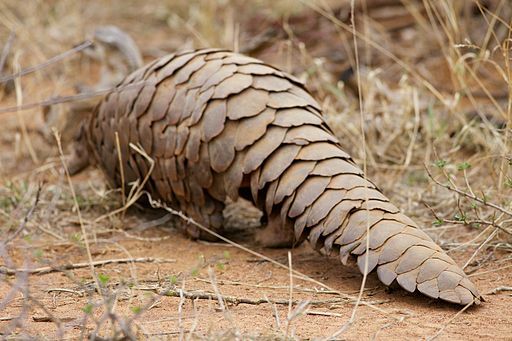 In taxonomic terms pangolins have their own order (Pholidota), with a single family (Manidae) and genus, Manis; there are 4 species in Africa and 4 in Asia. Like giant anteaters they are toothless (edentate), and indeed, they converge with the giant anteaters in a number of ways and for a while the two groups were thought to be closely related. However, it seems that molecular data (from DNA and amino acids) places the pangolins’ order as a sister group to the carnivores. So, the toothless state characteristic of both types of anteater has evolved more than once, as has the heavy musculature and massive claws of their forelimbs. I hadn’t really thought before about how pangolins manage to digest their diets of termites and ants, after licking them up with those sticky, extrusible tongues. (Here’s something else I didn’t know: a pangolin’s tongue is as long as head and body combined, i.e half their total body/tail length. It’s folded back into a throat pouch when not in use, and the animals produce so much sticky saliva that they have to drink frequently.) It turns out that the stomach is rather like a bird’s gizzard: its walls are hardened and it contains sand or very small pebbles, which help to grind up those crunchy meals as the muscles in the stomach wall contract and relax. It seems that yesterday was World Pangolin Day. It would be nice to think that drawing attention to the plight of these strange little creatures would change the fact that they are currently the most trafficked mammal in the world. After all, they range from vulnerable to critically endangered status and are supposedly protected by both national and international legislation. Sadly I think that greed and stupidity will push them over the edge. Greed: well, money talks. In December 2016, Chinese customs made their largest-ever confiscation of scales – a mind-boggling 3.1 tons from an estimated 7,200 pangolins. Their worth: about $US2 million. Research by TRAFFIC, a network that monitors the international wildlife trade, suggests that around 20 tonnes of pangolins, and pangolin parts, are trafficked each year.